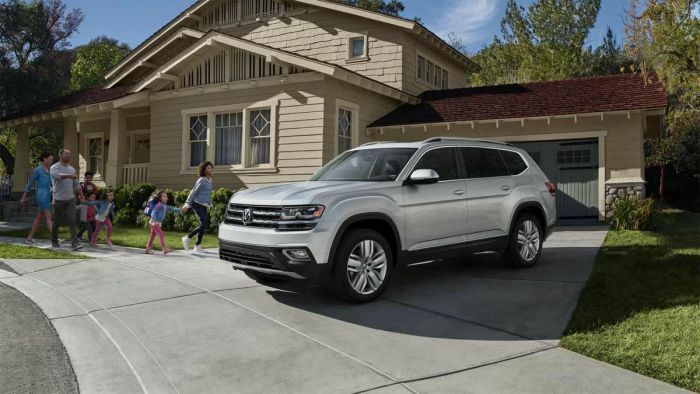 For the second year in a row, the Volkswagen Atlas received the coveted MotorWeek Drivers' Choice Award. The popular cable show said the SUV was the top in its category out of the many vehicles that its editors review. The winner was named at the Chicago Auto Show. For the second year in a row, Volkswagen’s three-row SUV has been named Best Large Utility by MotorWeek. The SUV topped its class in MotorWeeks Driver’s Choice Awards. The awards were announced at the Chicago Auto Show, the largest consumer-driven auto show in North America. The Atlas is a relative newcomer to the VW lineup. It was not the automaker’s first SUV as the Tiguan and Touareg filled that role. However, as noted by observers, the Tiguan had their limitations. Those limitations were size and practicality, primarily. The Atlas’ debut was in2017 as the automaker’s first three-row SUV. It is available with two engine options, a 2.0-liter, turbocharged four, and the automaker’s venerable 3.6-liter V-6 (VR6). Seven trim levels include the S, SE, SE with Technology, SE with Technology R-Line®, SEL, SEL R-Line, and SEL Premium. The automaker also offers its 4Motion® all-wheel-drive system on a variety of trims. The Atlas is built in the automaker’s Chattanooga, Tenn. plant, a state-of-the-art manufacturing facility. Prices for the Atlas start at $30,895. MotorWeek appears on the cable television channel, MotorTrend Network. The award winners are on the program’s website, Motorweek.org. They will also appear on a special episode of the show, airing on public television stations, starting tomorrow. The winners will also be on a special showing on cable’s MotorTrend Network beginning Feb. 19.